My CJ7 came to Missouri via Arizona. It has a modified 258 with headers and dual exhaust; an on-board air compressor, 4 speed manual, 8000# winch, completely skid-plated, rear locker sitting on 33's with a 3 inch + lift. She is retired from the sand and rocks and basically gets taken out for the sunny "in-town" runs. More than often, I have curiosity seekers asking me about her along with tales from them of the beloved Jeeps they once owned. 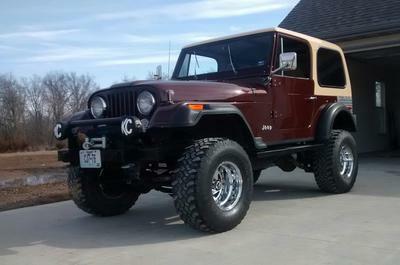 I've wanted a CJ7 since I was a teenager back in the 70's. I love this CJ! Editor's Comment: Very nice, Scott!